Derivative control (also called rate control) responds to the rate of change of the controlled variable. For example, if the temperature of a process is changing rapidly, the controller must respond quickly to keep the temperature within acceptable limits. 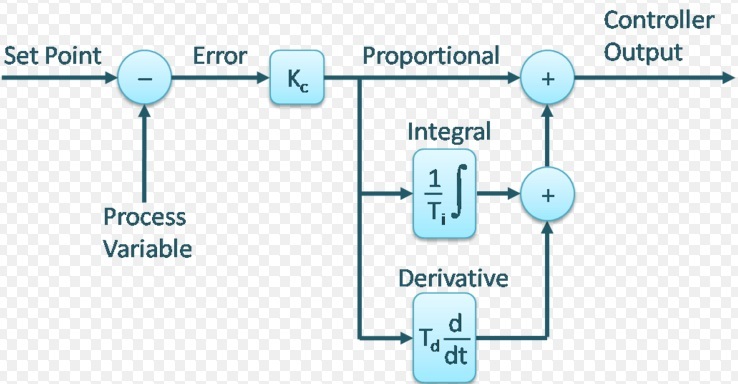 In effect, derivative control action uses the rate of change in a process to adjust the output of the controller. How much adjustment is made is determined by how quickly the deviation from the set point is occurring. Taking the derivative (or differentiation) is a mathematical computation that determines the rate of deviation from the set point. Using mathematical symbols, this computation is expressed as d/dx f(x). Derivative control is used in process control systems where lag time (the time it takes to measure a change) is large. Derivative control is considered difficult to implement and adjust; therefore, it is used only when the amount of lag time is extensive. It is typically used in combination with proportional plus integral control (referred to as PID control) for temperature control and other slow applications. PID controllers may be difficult to adjust. Derivative control is rarely used with proportional control only. Proportional plus derivative control, referred to as PD control, is desirable in processes where there are several different lag times.